Home is Knopp Branch Farm. Knopp Branch Farm is a small, family-owned, diversified vegetable and fruit growing operation outside of Edna, Texas in Jackson County. Begun as a weekend and future retirement retreat from the city, it has evolved into a full time job for Donna and Ernest Roth and a part time job for their children. The original goal was to provide a big garden for Donna and access to water for Ernest. But that changed with the first unexpectedly abundant crop of potatoes. What do you do with a surfeit of new potatoes and no storage? After a casual chat with an old friend at a wedding, it turns out what you do is get yourself a booth at a farmers market. So Saturday mornings at the Urban Harvest Farmers Market became the new ritual. “Grow more” became the new mantra. 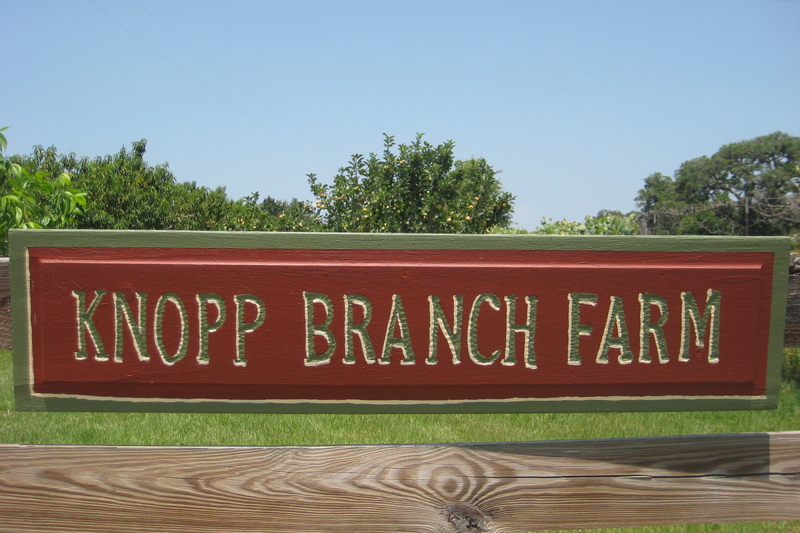 From that accidental beginning, and with lots of support from family and friends, you can now enjoy Knopp Branch Farm produce can in some of Houston’s best restaurants, in a Fall and Spring CSA share in Houston and Victoria, and at private events at the farm. From native pasture and woodland, we have re-pioneered a farm and homestead. Despite the start-up being costly, the work hard, and the learning curve steep, we have persevered. And because of the support and valued encouragement from our neighbors and friends, the folks at Urban Harvest and our fellow growers, chefs and customers from market, by golly, it looks like we may succeed. Urban Harvest is a local non-profit organization supporting a network of urban gardens, farms and orchards that inspire and empower people of diverse backgrounds to grow food in the city.